Actor Hyun Bin's long hair and baggy jacket do not make him look any different from what he looked like before. But the way he appears in the movie "I Am Happy" is anything but the same. The look in his eyes and his whole body say that he is a different person. His character definitely stands apart from his characters in the TV dramas "My Name is Kim Sam-soon" and "Worlds Within". To Hyun Bin, the movie "I Am Happy" was like his graduation. Though the actor is currently preparing for his next production in the U.S.--the remake of the movie "Late Autumn"--he squeezed time from his busy schedule to attend the screening of "I Am Happy". We met with him on November 16 at a cafe in southern Seoul. "I Am Happy" was screened at last year's Pusan International Film Festival as the closing film. It finally opened more than a year later. Hyun Bin said, "I wasn't worried about the late opening and about how many viewers would come to see it. It was quality time for me because I thought a lot about myself and learned a great deal. That's why this movie is special to me". Director Yoon Jong-chan of "I Am Happy" is known for being very stern on the set. Hyun Bin described him as someone who knows well how to use the carrot and the stick. He said, "During filming, he would scold me so severely that I felt ashamed. He did that to help me better portray my character's feelings when I had a hard time doing it. Once I performed well, he praised me. I have learned a lot from him". Hyun Bin says what he has learned from director Yoon will come in handy for him in his future roles. 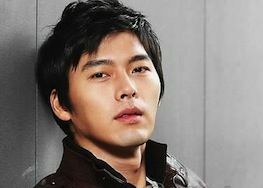 In "I Am Happy", Hyun Bin plays a man named Man-soo who is hospitalized with megalomania because he is unable to deal with harsh reality. He was once a kind-hearted man who silently accepted his mother suffering from dementia and his gambling-addicted elder brother, who later kills himself and leaves a huge debt behind. Feeling guilty and unable to withstand the pressures of life, Man-soo eventually loses his mind. At the psychiatric ward, he pretends to be a man whose mother owns a hotel in Switzerland and can send him money anytime if he just signs a check. With each scene in the movie being so overwhelming, Hyun Bin says he "wanted to die" when he was filming the movie. He said, "In hindsight, I have no idea how I managed to do the role. The scene where I struggle to get out of the water in my dream was the last one to be filmed. It was filmed in a 5 meter-deep swimming pool. We started at night and finished in the morning. I complained to the director for torturing me till the last minute. I even pushed him into the water". But Hyun Bin in no way complains without a reason. He lost four kilograms while filming the movie, even though it contains no action scenes. The very first scene had to be reshot several times. In the scene where Man-soo takes his sick mother to a karaoke room, Man-soo buys his mother her favorite dried squid and beer and the two sing. Then he leans against the wall and begins crying. He is shown with his back to the camera. Hyun Bin said that he put forth his utmost effort when shooting this scene. What viewers see onscreen was filmed after the director's "okay" sign. Nobody knows exactly when the "okay" sign ended. But even this heart-wrenching scene, in which the actor lost control of his emotions, was not the most difficult for him. The scene that presented him with the most challenge was the one that shows him silently repairing cars at a car repair shop. He said, "That scene was the very first one to be filmed. I felt enormous pressure. Though I discussed my character often with the director, I felt like I was being tested because I wasn't sure if I was doing the right thing". To the public, Hyun Bin looks like a man who has it all. On the question whether he is happy, he gave an unexpected answer. He said, "I thought a lot about the title of this movie. But the more I thought about "Happiness", the more frustrating it became. There is no answer to that question. I still can't say for sure if I am happy. It's a double-edged sword. It's all up to me".